The Charles Supper Company offers the original Cryschem MVD/24 multi-chamber vapor diffusion plate as a superior system for the growth of protein and other crystals. We include crystal clear sealing tape, at no additional charge with each order of Growth Chambers. 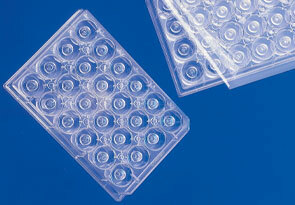 Our Cryschem MVD/24 Plates are made to the original specifications of the Scientist/Inventor of these plates. Each plate is individually wrapped to keep clean of any contaminants. The Charles Supper Company includes 4” sealing tape with each order, at no additional charge. The trays can be sealed quickly and securely using one 4” wide strip of sealing tape. The MVD/24 plate provides the convenience and handling ease of standard plastic culture plate without the use of siliconized and greased cover slips required by the hanging-drop method. Each vapor diffusion chamber has a plastic drop. The cup has been designed to provide maximum surface area for free diffusion during equilibration. The reservoir solution is held within the narrow moat surrounding the support post. This configuration is very stable and prevents splashing whenever the plates are transported.